3) If no one gets the exact number by noon EST, May 25th, I’ll pick the closest guess. Question: How many Prismacolor pencils do I own as of today, May 18th? This includes the ones that I use, all the stubby little pencils that are too short for my current sharpener but I just can’t toss, all the ones I have in reserve and my set of Verithin pencils I hardly ever use. Keep in mind my local scrapbooking store went out of business recently, and I hit first the 50% off sale, then the 75% off sale, to stock up on Prismacolors. So that “reserve” number is a little high. That’s the only clue you get, though! I am exempt from the contest, but I am going to guess 1,738.
i’m terrible at things like this, but… somewhere in the five or six hundreds… er… 675? BTW, i absolutely LOVE the dress! I love this! You know, checking to see if you’ve updated is one of the high points of my day. I think I have too my time on my hands XD I’m going to guess… 248.
this is beautiful!! one of my favs!! 943 colors maybe?? This is beautiful, I love the colours! And I shall guess 584. I love this dress!! I guess 264 colors?? 400 I guess. I love this dress! I’m definately printing this one out. I’ll guess 821. Love the peacock colors! 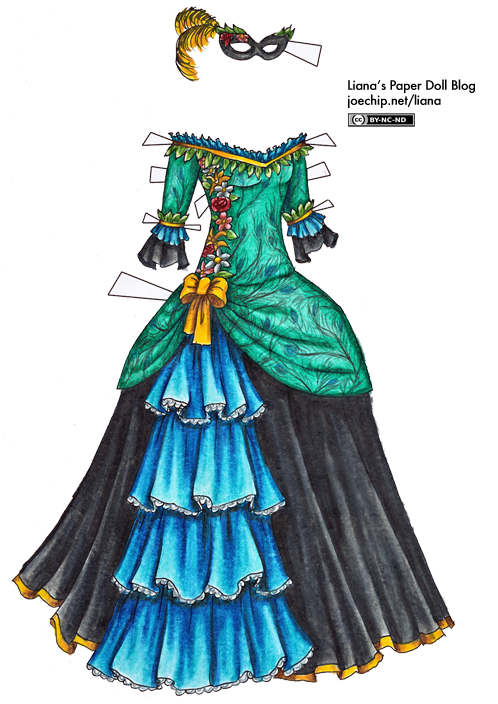 I colored the dress in light blue (overskirt), light violet (underskirt) ans light pink (ruffels) but your version is spectacular! Awesome colors! I’ll guess…. 146. I should probably guess higher, but we’ll see. I will be daring and guess higher then everyone else so far… how about 3,424? Hey liana! I have a problem I haven’t ever read your paper doll archive but never can because a google ad hides all the dresses! It’s impossible to select a dress or click on it and I can’t see any of your other beautiful creations. Is there anything that can be done? I would so love to see your other work. Splendiferous huh? :) Glad you like it! Julia, Kelly, are you talking about my really old archive (the one from, what was it, 2003? 2004?) or a page from my current page? Either way, I’ll see what I can do! What browser are you two using? Noon EST on the 25th has passed, contest is over! Please see the most recent blog post. This is my absolute favorite dress..:) beautiful work! !